The Hotel is conveniently located on the N11 Stillorgan dual carriageway, the main arterial route from Dublin City Centre to the affluent southern suburbs. It also has easy access to Fosters Avenue and the M50. There is ample free car parking at hotel for 220 cars. Children U 12 stay free in parent's room in existing bedding. Roll Out bed €22.50 per night. Talavera Italian Restaurant or Orangerie Bar light snacks. Le Panto Restaurant opens for Sunday Lunch. The wonderful thing about the Radisson Blu St. Helen’s Hotel is that glorious feeling of being on a private estate yet being in the city. 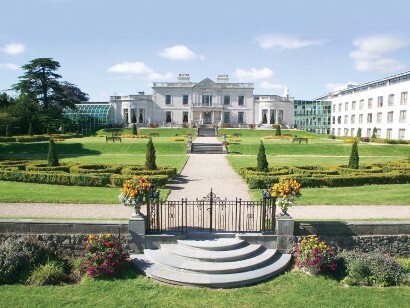 The 5 Star St. Helen’s Hotel is in fact the only hotel in Ireland’s capital city to be set in four acres of Italianate formal gardens, which gives a wonderful sense of style and freedom not to be had in any other hotel in Dublin. It is an absolute joy to walk around after dinner in the evenings or to sit out in the summer on the terrace at the back with a nice glass of wine and imagine yourself in the gracious times of the past. St. Helen’s is one of Ireland’s finest historic houses, which was meticulously restored retaining and enhancing its original features, to provide top notch hospitality and accommodation to visitors. Very much part of the community and social life of South Dublin, St. Helen’s is a favourite spot for locals to meet up for coffee, a drink, or a casual lunch, in the Victorian Orangerie Conservatory Bar & Ballroom Lounge, and follow up maybe with dinner in the Talavera Restaurant. All my friends stay here when they come to Dublin and absolutely love it. It is so convenient for town, as it is for Co. Wicklow, or indeed the yacht clubs and coastal life from Merrion to Dalkey. The guest rooms are superb, large and spacious, and located in an adjacent modern wing. There are 157 De Luxe rooms including 25 Business Class Suites, 11 of which have balconies. In keeping with the ethos and gracious hospitality of St. Helen’s , Deluxe rooms feature sumptuous fabrics, duck down duvets, air conditioning, large work desks, free high speed WIFI, a 26” LCD TV with 15 channels and in-house movies, a Mini bar and Egyptian cotton sheets. The Business Class Suites offer even greater luxury with a separate bedroom area, a Super Breakfast Buffet, a Nepresso coffee machine, and much much more. The Talavera Italian Restaurant is under the baton of Giancarlo Anselmi, and I have had many a good evening there. Delicious antipasti includes Bresaola served with Pecorino cheese and rocket, as well as Insalata Radicchio Pratalioli et Gorgonzola. Their pastas are wonderful. You can have them Italian style as a starter or Irish style as a mains! Paccheri Pescatore is a Sicilian pasta dish with mussels, clams and prawns, whilst Casarecce alle tre cipolle is pasta with three onions sauce. I rather like the ravioli of Swiss chard and ricotta with browned butter and sage leaves. Carne and fish dishes include chicken fillet with a Parmesan crust and Caponata – a favourite of mine – a mixture of aubergine, tomato, garlic, vinegar and capers. Osso Buco Gremolata is slow cooked veal shank, whilst fillet of beef with dolcelatte is a gorgeous rich dish featuring Gorgonzola. Pan fried fillets of plaice are Sorrento style with fresh tomato, black olives and basil, whilst roasted cod comes with my favourite fennel and saffron sauce. In addition to their a la carte menu they also have a fab four course Regional Tasting Menu from the Lombardy Region which includes a glass of wine from that area. For Sunday lunch they also open their beautiful Le Panto restaurant. Don't forget too to book yourself a lovely pampering treatment in the Pure Radiant Beauty Spa. It is total relaxation and they have a wide range of massages and beauty threatments using fabulous Elemis products. It is a wonderful location too for weddings or parties – it really is hard to beat as a venue and destination in Dublin City.